BURLINGTON, Mass., Jan. 11, 2017 /PRNewswire/ -- Endurance International Group (NASDAQ: EIGI), today announced that Google Domains (NASDAQ: GOOG) has selected its Bluehost brand to provide WordPress hosting solutions to new and existing customers. Google Domains customers can now also link their domains and create new accounts from Bluehost's website. 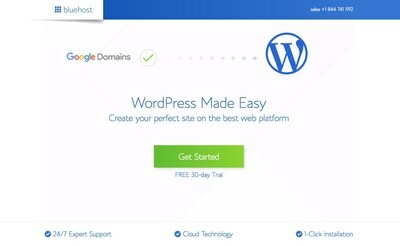 Bluehost's unique architecture offers customers proven performance, reliability and functionality for running a WordPress site, which is increasingly important as WordPress currently powers over 25 percent of the web and is the most popular online publishing platform available. In fact, many small businesses rely on WordPress to run their businesses and a recent SMB Trust Index cited WordPress as the most trusted brand for small businesses. This new Bluehost offering extends the relationship between Endurance and Google and reflects both companies' joint efforts to get small businesses online and help them grow. "Bluehost and Endurance have worked closely with WordPress.com's parent company, Automattic, for years now to ensure our web hosting platform would seamlessly run WordPress websites," said Endurance CEO & Founder, Hari Ravichandran. "We're honored to begin working with Google Domains to make it easier for small business customers to get online and manage their online presence." "We have a long-standing partnership with Bluehost and we work closely with them to ensure WordPress users' success, and to give back to the open source community," said Catherine Stewart, VP of Business Wrangling at Automattic. "Now with Bluehost teaming up with Google Domains, we hope to welcome more WordPress users to the web and to continue to help more small businesses get online." For additional information about creating and managing a WordPress web presence, visit the Google Domains support page, follow the instructions to "map your domain to a third-party web host" and select "Bluehost." Bluehost, part of the Endurance International Group, is a leading provider of cloud-based solutions, including web hosting services, eCommerce tools, marketing applications, and more. Built on open source, Bluehost designs and operates its own servers, develops innovative new internet technologies, and actively supports and participates in the open source community. For more information, visit www.bluehost.com. Endurance International Group (NASDAQ: EIGI) (em)Powers millions of small businesses worldwide with products and technology to vitalize their online web presence, email marketing, mobile business solutions, and more. The Endurance family of brands includes: Constant Contact, Bluehost, HostGator, iPage, Domain.com, BigRock, SiteBuilder and SinglePlatform, among others. Headquartered in Burlington, Massachusetts, Endurance employs more than 3,800 people across the United States, Brazil, India and the United Kingdom. For more information, visit: www.endurance.com.